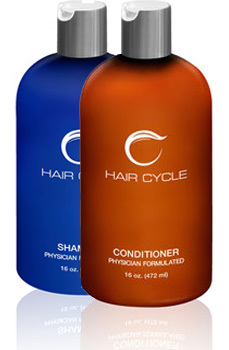 Hair Cycle Basic Kit includes Hair Cycle shampoo and conditioner at a discount. HairCycle Shampoo is a salon-quality treatment with the added benefit of DHT inhibitors -excellent for helping with hair retention. It includes biotin, proteins, and other nutrients as well. These ingredients add luster and thickness, better nourish the scalp, and encourage faster growth. HairCycle Conditioner brings strength, viability, and life to your hair. Adding a light layer of protection, this salon-quality treatment makes hair more manageable while also improving thickness and shine. Featuring a vast array of proteins and other nutrients, HairCycle Conditioner brings excellent nourishment to your hair and scalp.